White-backed Swallows with Tree Martins feeding in erosion gully on the aptly named Gully Track. Diamond Firetail, Striated Pardalote, Rainbow Bee-eater, Dusky Woodswallow and Fuscous Honeyeater in same area of open country [location]. Black Honeyeater in exactly the same tree as observed on 15th February [location]. Also White-backed Swallows in the same area. 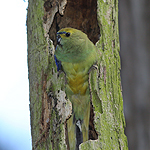 Other species present were Musk and Little Lorikeets, Fuscous and Yellow-tufted Honeyeaters, Rainbow Bee-eater, White-browed Woodswallow, Brown Treecreeper, Red Wattlebird. Spotted Harrier Circus assimilis at Strathlea [location]. I tracked this bird as it flew north for about 3 km along the ridge to the east of the Strathlea Road, eventually losing sight of it as it headed north towards the Moolort Plains. This is my second sighting of the species this summer (also seen 13/1). 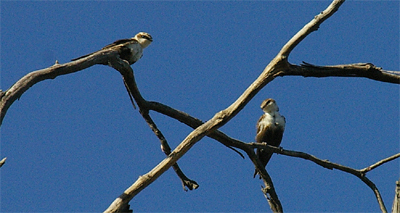 White-throated Needletails – overhead near Gully Track. 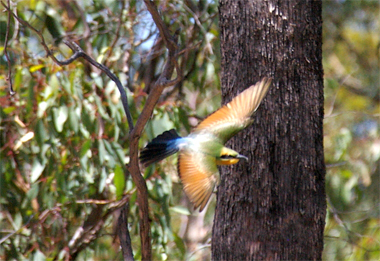 Large numbers of White-browed Woodswallows, Rainbow Bee-eaters and Fuscous Honeyeaters present. * Diamond Firetails (party of 3) near Gully Track [location]. 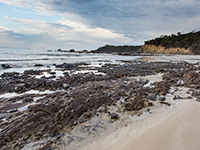 * White-backed Swallows (see post) with Rainbow Bee-eaters and White-browed Woodswallows, south of Gully Track [location]. 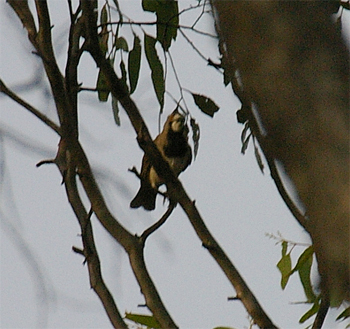 Crested Bellbird also heard calling at some distance to the north of here. Loose flock of White-browed Woodswallows (30+), White-browed Babblers (4), Black Honeyeater (see post), Little Lorikeets near Gully Track [location]. 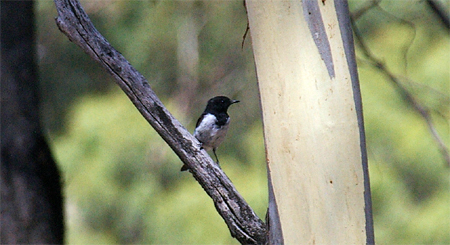 Male Hooded Robin seen and Crested Bellbird (heard) ~ 100 metres south of Gully Track [location]. This site is about 1km from other nearest observations so suspect different individuals. * Pair of Southern Whiteface Aphelocephala leucopsis in erosion gully near Sullivans Track [location]. * Small flock of White-throated Needletails over Spring Hill Track. Party of four White-browed Babblers seen from same location. Black-chinned Honeyeater Melithreptus gularis – a number of small flocks between Spring Hill and Mia Mia Tracks. Also an interesting mixed flock with Varied Sitellas, Eastern Yellow Robins, Yellow Thornbills, Brown-headed Honeyeaters amongst others that I wasn’t quick enough to ID. * Shining Bronze-Cuckoo Chrysococcyx lucidus – single bird seen on Spring Hill Track along with a flock of fabulous Rainbowbirds! * Female Hooded Robin in same area as reported on 30th January. * Crested Bellbird Oreoica gutturalis – spent an hour or so this evening quietly watching Bellbirds near Spring Hill Track. 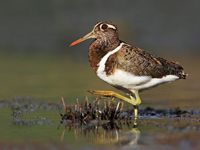 In this time saw a male (pictured below – apologies for the quality! 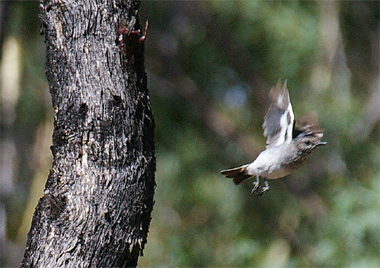 ), female and an immature bird. From the calls there appear to be at least two pairs in this general area. * Black-eared Cuckoo Chrysococcyx osculans – single bird west of Mia Mia Track – [location]. Also saw a Yellow-footed Antechinus nearby. * White-throated Needletail Hirundapus caudacutus – 2 hawking insects (8.30pm) near junction of Mia Mia and Spring Hill Tracks. * Hooded Robin – on Spring Hill Track – [location]. This bird, a male is about 1.5km from the male seen on Mia Mia Track on the 25th January so probably a different individual….which is great. Also a flock of Buff-rumped Thornbills at the same site. Collared Sparrowhawk Accipiter cirrocephalus – over canopy south of Spring Hill Track plus at least two pairs of Crested Bellbirds calling! Got some photos of a male but they were rubbish! * Crested Bellbird again – this time north of Spring Hill Track [location] at 11.00am, a single bird flew from a Grey Box to the ground where it fossicked for food. I’ll get a photograph eventually! Also Rainbow Bee-eaters, Weebill, White-throated Treecreeper and a female Hooded Robin in the same area. 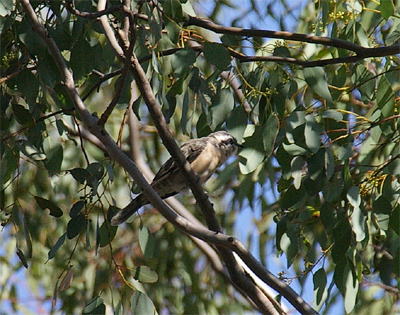 * White-browed Babbler west of Muckleford Creek [location] – single bird on roadside tree. Crested Bellbird on Spring Hill Track at 8.30am [location]. Single bird flew south across the track and then perched in a Red Box about 4 metres off the ground. Same territory as birds previously observed on Mia Mia Track. Good numbers (50+) of Tree Martins Hirundo nigricans mixed with Welcome Swallows at Strathlea – [location] . 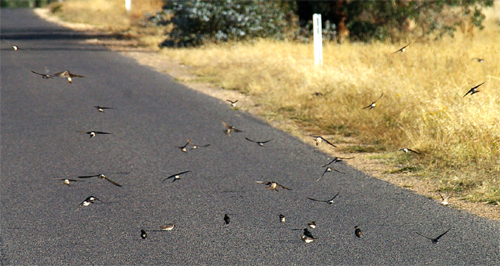 The Martins were happily sitting on the road between bouts of hawking for insects. It was a cool evening suggesting they were taking advantage of the radiant heat of the bitumen. Chestnut-rumped Heath-wren – single bird seen crossing Mia Mia Track – [location]. 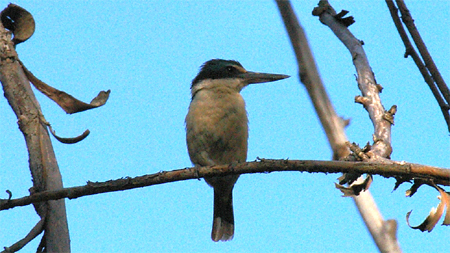 Sacred Kingfisher Todiramphus sanctus on the Loddon River between the Panmure St crossing and “The Reserve” – [location]. Pair of Hooded Robins Melanodryas cucullata on Mia Mia Track [location]. Observed in early afternoon heat ~ 32 degrees. 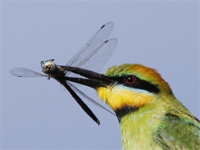 Rainbow Bee-eaters – party of ~ 10 hawking insects on Bell’s Lane Track [location]. 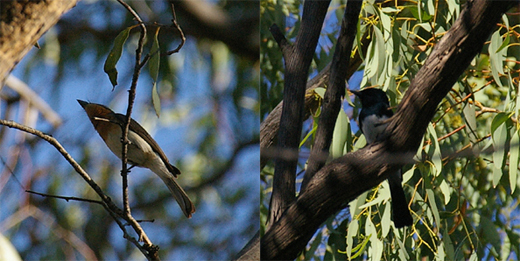 White-bellied Cuckoo-shrike at the same site. 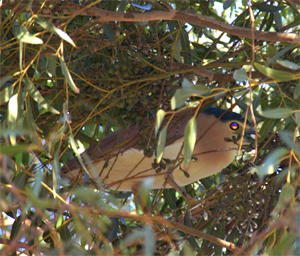 Nankeen Night-Heron spotted by Jo Ralston. A single bird roosting in a Sugar Gum on her property overlooking the Loddon River [location]. This site has been used by Night Herons over a number of years. 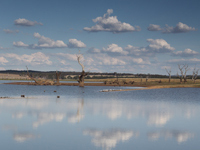 3 Wedge-tailed Eagles over western wall of Cairn Curran Reservoir [location]. Pair of Satin Flycatchers (same site as 13th January). 14th January 2010Parent and juvenile of both Australian Hobby Falco longipennis and Nankeen Kestrel Falco cenchroides at Joyces Creek, Cairn Curran [location]. 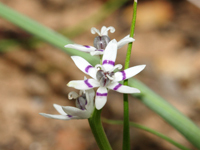 * Male Satin Flycatcher Myiagra cyanoleuca – in Long-leaf Box/Yellow Box Woodland near Drury Lane in the Rise and Shine [location]. 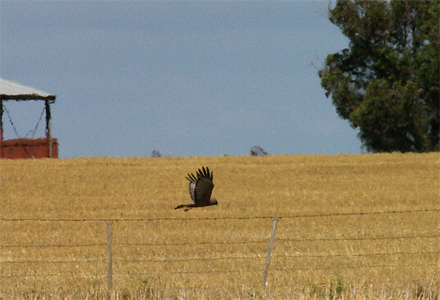 * Spotted Harrier Circus assimilis – single bird gliding low over cropland on Baringhup – Joyces Creek Road. [Click for location]. White-bellied (Little) Cuckoo-shrike Coracina papuensis – single bird seen on Cemetery Rd, Green Gully [Click for location]. This Flame Robin Petroica phoenica (pictured below) was observed on Main Track [location] in the Sandon State Forest. It is unusual to see this species around Newstead in the summer as most birds return to higher elevations to breed. I do recall them regularly staying over summer however during the 1980s. The picture is not great, but this bird had a wash of colour on the breast. 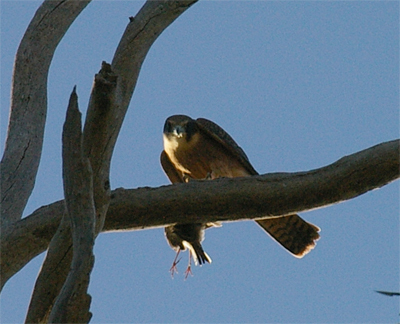 Peregrine Falcon Falco peregrinus – single bird chasing Feral Pigeons near Newstead PS. I am wondering if you have any dates and swift numbers to report since the ones listed last season. Thanks for listing these three where I could find them for my research. Mike – despite looking out for them over summer I have only seen one White-throated Needletail all season – 16th February over the Rise and Shine Bushland Reserve, south of Newstead. I know of other folks who have seen flocks this season but I’ve struck out.